11:00 AM – iNSD inspiration with Sheri Reguly! Hello, and Happy International Scrapbook Day! Sheri Reguly here! There are so many beautiful designs to be found in our Inspiration Gallery, that deciding on a single piece to base today's layout on was no easy task. I ultimately decided on Sherri Funk's layout entitled, The Crew, which could be found on page 68 of the summer 2016 issue. Here is Sherri's layout. I carried several aspects from Sherri's layout over to my own design. I loved the large block of patterned paper along the right hand side of her page, with the crisp white cardstock directly to the left of it. I also loved the clustering of embellishments in the bottom left corner, as well as the dramatically bold, black title. Here is my layout based on Sherri's design. Tip: In addition to incorporating a second photo, I also opted to omit the journaling (which I very rarely do) and I positioned the title vertically, along the left hand side of my photos, rather than beneath them. I simply could not bring myself to cover up any on this adorable swimsuit patterned paper from Crate Paper's, Oasis Collection. Each hour our wonderful partners are joining us to celebrate this day and to celebrate you! This hour we have prizes from Scrapbook.com and CAS-ual Fridays Stamps! Happy (Inter)National Scrapbook Day! Scrapbook.com is excited to be here with our Scrapbook & Cards Today friends and offering a $50 gift certificate for one lucky winner! We're also so happy to bring you a weekend full of fun! Stop by our website and enter one of our 5 Challenges for your chance to win over $6000 in prizes, plus even more challenges hosted by our members. 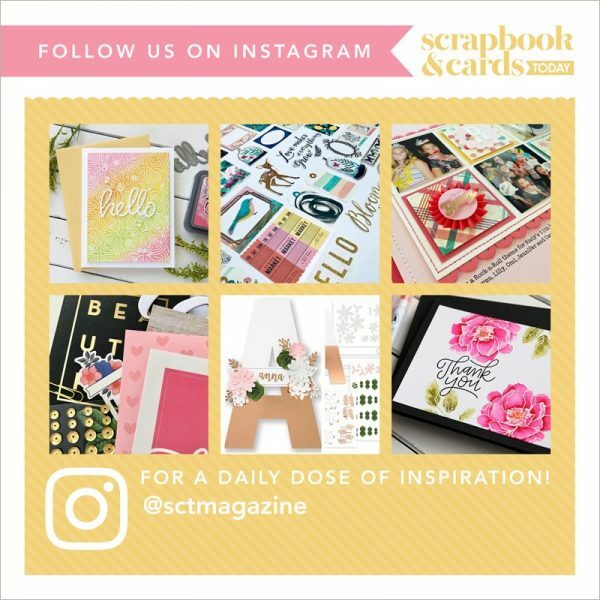 Spend the day with Scrapbook.com for great sales, inspiration and more. Creating beautiful, meaningful, handmade projects, one memory at a time. Happy International Scrapbook Day from CAS-ual Fridays Stamps! We are thrilled to be able to celebrate with all the scrapbookers across the globe! By the way, we don't think 1 day is enough to do this special event justice, so we are giving you all permission to keep on partying and scrapping all through the weekend! We'd love to meet you, so please stop by our facebook page or Instagram to say hi and follow us. Happy scrapping! Thank you so much Scrapbook.com and CAS-ual Fridays Stamps for another amazing prize package! For an opportunity to win each hour's prizes, be sure to leave a comment below by Saturday, May 13th! Winners will be announced on May 15th! Good luck! Thank you for joining us this hour! Be sure to join us each hour until 6:00pm today for inspiration, tips and techniques from our team and of course PRIZES! If you’re just joining us, welcome and be sure to start at the very beginning for our 8:00 am challenge! Ahhhh! Love the rainbow of colours! Oh happy day! So pretty! Rainbows are amazing, in whatever form. Love the layouts and these stamps – great for layouts and cards. I love those CAS-ual Fridays stamps. I live for Fridays!!! So cute. I love these colorful layouts! Both layouts are gorgeous! Thanks for the inspiration! I’m loving the layouts so far! Great inspiration and such gorgeous colours. so much fun stuff today, thank you !! Oh Wow such inspiration, great layouts. Thank you for the chance to win such a great prize but also thanks to your generous sponsors. I am scrapping with you and with scrapbook.com today. no local stores haha so me and my music and all my buddies here. I just found out about those stamps from another time I was scrapping with you. love them. Great day to celebrate NSD ? Love the bathing suits! So cute! So adorable! Love the layouts. Can’t wait for the summer to get here. And awesome prizes too! How much fun could be had withthese special prizes. Thansk for the chance! I liked seeing how you changed your page from the inspiration page. Oh my goodness–you had the perfect way to use that adorable swimsuit paper! Just love your layout! Thanks for a chance at another great prize package! Love the beachy theme with all the bathing suits and the fantastic colors! I haven’t heard of this stamp co before, but I like what I see! Thanks to the sponsors for offering prizes. OH I LOVE how she used the inspiration page!! The swimsuit paper is adorable!! Thank you sponsors for this fabulous chance to win!! 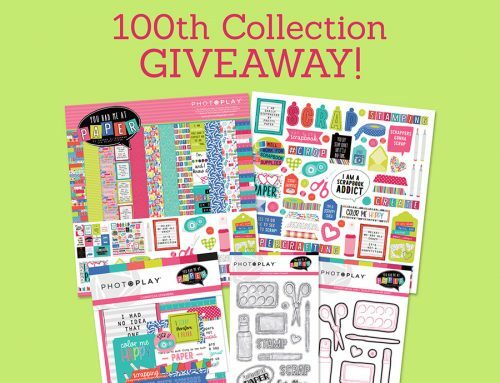 Wow – what great prizes – I love scrapbook.com. I really like these layout ides too. Going to try one right now! This reminds me of paper dolls. I really like this one. Happy Int’l Scrapbook Day ! I would love to win the amazing Scrapbook.com and CAS-ual Fridays Stamps prize packages!! Thank you for the chance to win! Love that swimsuit cardstock also! I would not be able to cover it up either! Thanks for the giveaways! I love both layouts. Thanks for the inspiration today. I’m having a hard time keeping up! Thank you to two great sponsors for two great prizes! What great layouts … I have a ton of pool and beach pictures and your layouts give me some wonderful inspiration! What an awesome way to spend a rainy Saturday–enjoying all these posts and dreaming of winning so many great prizes! Wow, looks be the swimsuit Paper. Very nice page. Thank you Scrapbook.com and CAS ual Friday Stamps. What a great background idea: white paper and bold patterned paper! I will be working on a layout for a former 4th grade student who graduated last year. We took a picture while she came by to visit me in my current teaching position of K. I cherish that photo and I can’t wait for her to cherish the framed layout! I was spinning my wheels on getting started, but now I have a starting point! I have cap patterned paper that I could use by the white paper! Thanks for the inspiration Sheri and Sheri! Awesome layout inspiration! Thanks SCT!!!! Such great prizes! Thanks! FYI…the link for CAS-ual Friday Stamps is not working. Let’s go shopping now! Everybody’s learning how! Let’s go shopping today! Great prizes and I love that swimsuit paper! So cool! TFS! What a cute LO with the bathing suits. You’ve given me a good place to start a page I’ve been contemplating. Thanks for the chance to win. Love both layouts! I see more scraplifting in my immediate future!!! Thanks again for more inspiration and amazing prizes to be won! This is so pretty! Loving the inspiration! Left them some love! Thanks for the chance! I am in LUV with that huge expanse of patterned paper with the bold black identity phrase atop the single photo! I shall spend time today searching for the team photo I want for this layout! What a great find to see on Nat’l Scrapbooking Day! Thanks! Wow! What wonderful prizes! Thanks for the chance to win! for the prizes today. Woo hoo!!! I’m having so much fun today with all the prizes and inspiration! Thanks for the awesome giveaways! Great layouts, thank you so much!! Thank you all for everything you do for us! Great prizes-what a way to celebrate INSD! I am in love withy that bathing suit pp! Thanks for the chance to win! Perfect layout for the bathing beauties!! Love the vertical design on these pages, I have never tried this design concept, so will add that to my ever growing list of must do’s! Fun prize this hour. I love the LOs, especially the block of patterned papers. Love these prizes!! Thank you for the chance to win!! oh so fun and cute! Definitely a great summer inspiration! I love these layouts. The design is pretty simple, which I love, and the details just make them shine. Gorgeous LOs! love how you paired photos with cute swimsuit paper. Love those retro-bathing suits! Great layout and prize! More great inspiration, I’m definitely going to have to lift this one! Great summer inspiration for scrapbooking and such fun papers. I can’t wait to get started! Love Scrapbook.com and shop with them as much as possible. They have great products at good prices and they always ship things quickly. 🙂 They are a great resource for paper crafters of all kinds and the perfect company to be part of this Scrapbook Day 2017. Love these one photo layouts! Fun…fun…fun! Thanks for a chance to win some amazing prizes. Love the summer layouts. I love the layout such fun with the bathing suits! Gotta love National Scrapbook Day and SCT! Thanks to scrapbook.com and Casual Friday’s for such great prizes! Beautiful pages and an awesome prize! Happy NSD! Gorgeous pages from Sheri and Sherri! That swimsuit patterned paper is super summer-ready! Thanks for the chance to win from scrapbook.com and Cas-ual Fridays Stamps. Happy iNSD! How adorable are those 1-page layouts! So cute! I love the first beach page and scrapbook.com! Liked the multiple use of initial letters in the layout, great prize. Sheri’s layout page is too adorable. I love the summer theme and that swimsuit paper is so cute. It’s been a blast checking in every hour with SCT for great inspiration. Thanks! So inspiring. I loved the switch the B&W photo with the colorful paper. Great adaptation. Wowzers! Fun layouts and awesome prizes! Oh I have had my eye on the laser ruler at scrapbook.com for ages (as my husban always saye my layouts are crooked) would so love to win this prize – Thank you to the sponsors and happy NSD everyone. Happy NSD! Love the layouts and prizes! More great layouts! Thanks for the inspiration as well as a chance to win such a fabulous prize. Such great layouts and great prizes! What a fun and summery layout. Love the bathing suit paper! Thanks for making iNSD so fun! Thanks also for the great giveaways! Another super idea! Love the bright colors and ideas! Thanks to Scrapbook.com and CAS-ual Friday’s Stamps and Scrapbookandcardstodaymag.com!! So much fun to see all these creative ideas today! Amazing inspirational pages! Great giveaways too. Thank you Scrapbook.com and CAS-ual Fridays for your generous prizes. That bathing suit paper is so cute! Love the layouts! Thanks for the chance to win! Love these beautiful layouts & the swimsuit paper. Thanks for the chance to win a shoppin spree at Scrapbook.com & the awesome stamps! What a fun page! Getting ready for summer, get out the swim suits! I love using other layouts as a “sketch” to scrap my way…it’s a great place to start…love how you did this! Your summer pages are awesome. Love the bathing suit idea! OH that swimsuit layout! Sppechless! Both layouts are great. Thank you to this hours sponsors. Oh so lovely! Inspiration galore today! Happy INSD! Find inspiration anywhere, right? Love the color wheel of tools photo. Such a pretty layout! So inspiring. Thanks to scrapbook.com & Cas-ual Friday Stamps. Great layouts! Thanks to the wonderful sponsors! Very cute! Just love that swimsuit paper! I love the bathing suit paper! The suits are perfect to accompany the photo. Love, love, love CAS-Fridays stamps!!! I envy Sheri and others that can convert an inspiration layout to their needs, though I agree wholeheartedly that you cannot cover up any of that patterned paper! Too cute!!! Love everything summer!! Some great layouts! Ohhh I love that swimsuit paper!!!! Thanks for a chance at some great goodies! that cardstock is awesome–as is the layout! What fun layouts! Really catches the summer colors and fun! That’s a great way to use a cute themed paper. I hate covering them up too! Love all these prizes. thanks for the chance to win. What a beautiful take on Sherri’s layout. The inspiration gallery IS amazing! Happy National Scrapbook Day! I love that colour picture! Great prizes, too! I love summer and water activities themes. I started scrapbooking to document my first cruises! I love the embellishment on the first layout! So cute and so much to look at! I also love the b&w photo with the color of the second layout. Very nice! how cute are those stamps!!! Love these samples and prizes! Love “the crew” layout, going to using these ideas in my next layout! Thanks to all for giving me a chance to win great prizes! Awesome pages and giveaways. Thanks for the chance. I have some stamps but I’ve yet to use them. I’m excited to go to CAS-ual Friday Stamps’ social media and look for ideas! I didn’t know what to do with that adorable swimsuit paper until now. Lovely. Love that swimsuit paper with your pic. What fun paper – thanks for great prizes!!! What a happy and fun summery layout. I love the subtle use of pinks in the patterned paper to offset the black and white photo. Great prizes!! Thanks for chance to win. OMG! Love the papers used! This is so much fun! Thanks for making this day fun! Love those stamps, and that swimsuit card stock!! Oh wow, what a fab layout! Your swimsuit DP is absolutely perfect for your pics! That Oasis collection from Crate Paper is the best! The swimsuit cardstock is so awesome! Thanks so much Scrapbook.com and CAS-ual Fridays Stamps for such awesome prizes! I, too, love that swimsuit paper. What a perfect LO to let it shine! DARLING summer layouts — who doesn’t like to go tropical?! That swimsuit paper is adorable! Thanks Scrapbook.com & CAS-ual Fridays Stamps! Cute layouts! having fun paying along ! Thanks for the chance to win. That bathing suit paper is adorable, and I love the title flipped vertically. Great ideas! I could easily spend the gift certificate!! Eeeek,I love that color wheel of goodies! So happy. Thanks to the sponsors for such generous prizes! Great layout Sheri! Thank you for the giveaways SCT, scrapbook.com and CAS-ual Friday stamps. Love the swimsuit paper. That is so cute! Super layout to work with. Absolutely love that swimsuit layout!! Super cute! Thanks for another great hour of inspiration! Love the swimsuit layout. Great prizes too. Ohhh. Love that rainbow of goodies from scrapbook.com! Great layouts! And great prizes as well-thanks for the chance to win! Both the wave paper and the swimsuit paper are so fun! Perfect for summer layouts! Yeah! I love this!! Happy Day! Oh that swimsuit paper is so cute!!! Man, I could do some damage to my Scrapbook.com Wishlist with that gift certificate! Love the swim suits that set up summer fun. Glad we’re getting to summer! That is a great layout I will definately be using this one. Very nice layout, Sheri. Love that paper! Love these awesome layouts! Creative and inspirational! Love all of those swimsuits! Love the swimsuit paper – really highlights the whole layout. Another great giveaway – thanks SCT sponsors. Oh I love how the swimsuit paper was used, what a great idea! Those are adorable stamps. I hadn’t seen that line. Great Layouts that have inspired me today. Thanks for this day. I can’t wait till each hour clicks by to see what is next. Such a cute scrapbook page! Makes me long for summer (especially when the weather forecast calls for a chance of snow tonight…). Thanks for the pretty eye candy and, as always, for the awesome prizes! Sherri’s layout is fabulous and I remember seeing it — using this layout as inspiration and well those little swimsuits .. PERFECT! Some summer inspiration! Thanks Scrapbook.com and CAS-ual Fridays Stamps for another amazing prize package! The paper is so perfect for that lay out. Love it! Love the retro bathing suits! Two great layouts! Love the rainbow of supplies! Very cute layout Sheri! Also thanks to Scrapbook.com and Casual Friday stamps for the wonderful prizes. Great layouts and prizes! Thanks! I love all these summer layouts ! Cute idea! Love how you used the inspiration. BOTH INSPIRE and DELIGHT with these wonderful bathing beauties! Such a cute layout with all those bathing suits! Thanks for the opportunity to win such a unique prize. I can always use more supplies I don’t need. Those stamps are so cool!! Great scraplift! I love CAS-ual Fridays Stamps and Michele the owner. I would have so much fun shopping with these prizes. Great layout inspiration Sherri! Thank you CAS-ual Fridays for the permission to keep on partying! Right on! Now I would love to win $50 to spend at Scrapbook.com ? Love the antique bathing suits! Wow! Great prizes and always full of inspiration! What great prizes! And I love the pages! Great inspiration. Thanks for sharing some wonderful layout inspiration with us! I’m pinning away! and thanks so much for the prize opportunities! What fun layouts! Thanks for hosting NSD and the all the fabulous giveaways. Love the swimsuit layout. The paper coordinates perfectly with the photo. This is so cute and fun! Love it!! Always looking for ways to use patterned paper on my layouts. Thanks for the inspiration. Love the layout and that swimsuit paper! Amazing giveaways!! Great layouts and great tips too!! Thanks for the awesome inspiration, Shery!! Such fun pages, love the great embellishments and photos. Fabulous prizes again this hour. Happy iNSD indeed! The swimsuit paper is too cute to cover. Great layout! Thanks for the chance to win! Such amazing inspiration and amazing prizes! Thanks for all the festivities today! 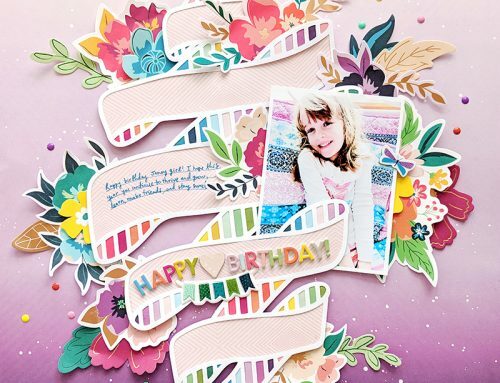 Love your layout – that patterned paper is so much fun and appropriate! I really love the large piece of patterned paper. Looks really beautiful and brings the whole thing together really gorgeous. And again such an awesome giveaway ?? I love the stamp sets. Thank you for a chance to win! Great layouts and I really like the use of black and white photos. They really pop next to the colourful paper. I love how this layout has a semi-vintage twist to it because of the black & white photos! Super cute idea! 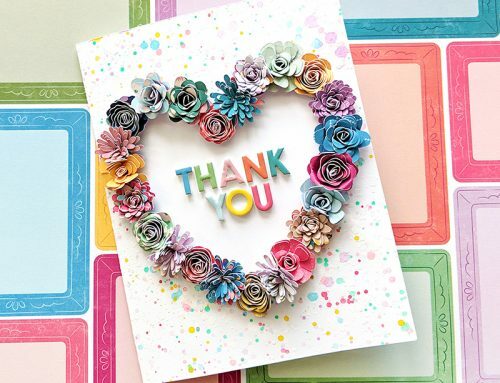 Thanks Scrapbook.com & CAS-ual Fridays Stamps for the chance to win! Happy NSD! So generous! Thank you for the opportunity to win! I love the bathing suit layout. What an inspirational take on the papers. Oh my goodness, all of these amazing layouts make me wish that I was able to scrapbook this weekend! This one is so fantastic for showing off a favorite piece of patterned paper– and what a perfect way to draw attention to the cute swimsuits in the photo! Love the vibrant colours in these layouts. Love the colors, love the layouts! Thank you! Great layout! Awesome event! Great prizes! Love the layout. thanks for the great giveways from both products. Thanks SCT. I love this layout of Sheri’s so cute! thanks for the chance to win! What a great layout, thanks for the inspiration & the chance to win!! the layout are fabulous… love the one with the swimsuits… too cute!! Fab summer layouts… and sponsors and prizes, too!! Great layouts! Love the inspiration! Thanks for the chance to win! Gorgeous layouts !! and such great prizes once again !!! Loving this day of inspiration and prizes, SCT! Great summertime layouts! Love luv LOVE the swimsuit paper and the pics are great too! So fun! The nostalgic swimsuits are so fun!! Great layouts! Fun prizes!! I love NSD! Such cute pictures and they go perfectly with that adorable swimsuit paper!! Love that layout. Thanks so much for the inspiration and wonderful giveaway! Thanks for all the inspiration today and the chance to win these great prizes! Two great layouts! Wish I had time to scrapbook yesterday but yard work was calling. Thanks sponsors, for the wonderful prizes. I like the changes you made. Cute layout. I love the fun DP for your layout! It’s so great! Thanks for the inspiration and being so wonderful! Super fun summer layout! I love the Crate Paper cardstock used. Thank your for sharing and for the opportunity to win! Love that bathing suit paper. Thanks for the chance to win! Gorgeous inspiration by Sheri and Sherri! Love this LO! Happy (inter)National Scrapbooking Day! I wouldn’t want to cover up that bathing suit paper either! so cute! absolutely love the inspiration layout! and more great prizes! it’s like christmas! Love how different papers make the same basic layout look so different! Cuteness! I love all my old pictures of my kiddos in their swim suits…. both layouts are so fun! Both layouts are fantastic! Great ideas – and that bathing suits paper made me smile. Pretty layouts, love the layering! Thanks for the inspiration and giveaways. Great stamp sets from CAS-ual Fridays and would love a gift card from Scrapbook.com- thanks to all for prize donations. This is so much fun! Thanks for the inspiration! I’m loving seeing all these wonderful layouts! Happy NSD to everyone! These giveaways are so awesome! Those stamps are so cute! Love the Summer layout! Love the samples. Thanks for the chance to win and the great prizes. I love the interpretation of the original layout. And I too would have a hard time covering up those swim suits. Such cute paper. Thank you Scrapbook.com and CAS-ual Fridays for the prizes. Beautiful layouts! I love how you’ve added the bold black title. The embellishments are beautiful. I love that both pages demonstrate how to use a vertical border strip to ground a design. And I love all the clusters: I really need to work on mine! And thanks to the sponsors for making this an extra special day! Amazing layout. LOVE the swimsuits. So cute! Thanks for the fun giveaway! I love scrapbook.com! Great layouts! I love that swimming suit paper! It was such a rainy Saturday it was nice to see this summer layout!! Thanks to Scrapbook.com and CASual Fridays! So inspiring and colourful. Love It! Love the use of such a large piece of cardstock..would always wonder what to do with swimsuit paper…gorgeous!! Thanks to all the sponsors for their prizes! Oh, I love the nautical tie in to the pool party! Great idea! Love the layout Sheri did. The black and white photos with the bright colors of the pattern paper make me very happy. Thanks all for the inspiration, prizes, connection and fun! Great inspiration to spark that creativity we all sometimes need when it comes to scrapbooking. Loving those layouts! The swimsuit paper is wonderful. Thanks for sharing. What an amazing layout!! Love the paper! I would just love to win the prizes for this hour! love the layouts! thanks for a chance to win! Like the vintage feel to the page. I love a layout with a centered focal image and side elements! So much fun and so many great prizes. Love all the layouts, so many great ideas to try. Thanks for a chance to win. Both of these layouts are great. Thanks for the chance to win a prize. Love these layouts, thanks for sharing! Oh my scrappy goodness!! These layouts are just too cute! Thanks fo so many chances to win. 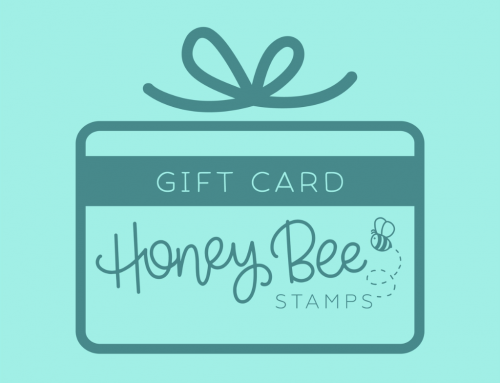 I would love the win a 50.00 gift certificate! Thanks for the chances to win! Another wonderful prize pack. I love those layouts – the matching of the papers to the subject is fun – love the swimsuit paper! I love the vintage feel of this layout. That swimsuit cardstock is wonderful! Cute stuff! Thanks for the chance to win. The bathing suit layout I just may have to scraplift. Great layout. Love the swimsuit patterned paper! Love the mix of the bright coloured paper with the black and white photos. Awesome. What a fab inspiration piece, I can see myself lifting this very soon! Such a great way to use a favourite piece of paper. Thank you and all the sponsors for making this event possible. Love Scrapbook.com, and but CAS-ual Fridays Stamps is another new one to me. Thank you for introducing me to them as well. Love the swimsuit layout! Keeps me inspired that it might someday be warm here again! Thanks to Scrapbook.com and CAS-ual Fridays for the prizes. great inspiration! thanks for the chance to win! I think that some papers are lovely, but quite hard to use, but you rocked the swimsuit paper! Thanks for the opportunity to win EZ. These pages are awesome!!! Such great inspiration!!! Love those swimsuits. Thanks for the inspiration and giveaways! Fun layout Sheri, love the swimsuit design. What fun stamps! Thanks for such great prize giveaways! Love the layouts! Thank you for such great give aways! Super cute swimsuits on the pages. I love the use of white space in the first layout, and the whimsical feel to the swimsuit page. So much fun! What a fun giveaway! I’d love to win! Great layouts! Love the simplicity of it. Thanks to the generous sponsors for the giveaways! What a great layout! Love that bathing suit paper!! Thanks for the chance to win! Love both these layouts! Great inspiration! Would love the gift card to scrapbook.com! Really love how this layout follows the inspiration page and the swimsuit paper is adorable. Great layout and thanks to all the awesome sponsors!! Oh wow…lovely prizes! That layout is beautiful. I am loving all of the inspiration!! Another prize with a gift card to one of my favorite companies, Scrapbook.com, and another company I’m not familiar with. I began this wonderful journey as a stamper back in the day, and my love for stamps hasn’t wavered. My favorites are sayings, alphabets & backgrounds, and I love finding new companies! Stamping is always such fun – even better with a new stamp to play with! Love that trendy, bold font and wave paper! Awesome prizes and love the layouts. Thanks for the chance to win. Two awesome layouts! Thanks for the chance at your giveaways! What amazing layouts, love the swimsuit patterned paper, so retro. The water theme is great! Nice job. Wow – super generous prizes! I love the layouts on this post. I think scrap lifting is in order (for my own albums only). Wow, love the original layout and your take! Just gorgeous! Thank you for sharing and for the chance to win great prizes. I absolutely love that swimsuit paper from Oasis. Love the layout and the prizes. The swimsuit paper is so cute! I can’t wait for summer. Thanks for the chance to win the prizes from Scrapbook.com and CAS-ual Fridays Stamps! Great pages. I love the idea to use a busy print off to the side so it doesn’t distract away from the photo. Love the colourful layouts! and thanks for the chance to win some prizes. Very cool, love your take on it! What a fun summer layout! 🙂 Thank you for sharing. And thank you so much for the giveaways today. Awesome layouts! Thanks for the inspirations and the Amazing prizes! Great layouts! The swimsuit cardstock is cute 🙂 Awesome prize packages – what amazing partnerships ! Both of these pages are absolutely adorable! Cute, summery layouts! Fantastic! Thanks for the inspiration! That swimsuit paper is too cute. Love the layout. Love the layouts! Thank you sharing! thanks for the chance to win! Super cute layout and inspiration. Love the prize up for grabs also! !